What is 4 colour process printing? | What does 4c/4c, 4c/1c or 4c/0c mean? What is 4 colour process printing? Print Arabia specialises in full colour CMYK printing (also known as 4 colour process printing). CMYK printing means that four different ink colours are combined to create a range of printable colours on paper. 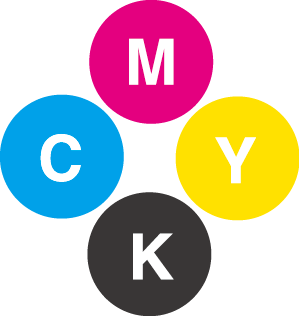 CMYK refers to the 4 colour inks: Cyan, Magenta, Yellow and Black (also known as Key),which are used in Offset and Digital printing presses. When combined in formulas these 4 colours can make a wide range of colours. Don’t worry, your printed piece will have more than just four colours! Due to the complex nature of CMYK printing,all full colour printing is subject to a small degree of colour variance.This means that some colours may look slightly different between one print run and the next. Offset presses reproduce colour more consistently than digital presses but the mixing of inks means there will always be a slight colour difference. This is a common and expected outcome of CMYK printing. What does 4c/4c, 4c/1c or 4c/0c mean? In the print industry there are lots of shorthand terms used for describing the type of printing. You may have seen some or all of these terms when receiving information from your designers, or when communicating with printing companies: 4c/4c, 4c/1c, 4c/0c, 1 side colour, 2 sides colour, front side colour, back side colour, both sides full colour. 4c/4c, means both front and back sides of the paper will be printed full colour (CMYK). 4c/1c, means the front side will be printed full colour with all 4 colour inks (CMYK) and the back side only receives one ink colour (black). 4c/0c, means the front side will be printed full colour with all 4 colour inks (CMYK) and the back side has no ink and will be completely blank. Please note: If you want to print you artwork in grayscale (using black only),please make sure to convert any images to grayscale mode in Photoshop prior to using them in Illustrator or InDesign. On screen the image may look black & white, however, unless the image says grayscale mode at the very top, chances are it is not grayscale. Failure to convert images to grayscale may result in the images printing differently than you expect.